Participants will be introduced to a variety of screen printing techniques used for fabric or paper. Techniques include: stencil techniques, rendering art for screen printing, photo process with emulsion, and transferring stencils into a print ready screen using SAW’s print shop. Students can bring their own t-shirts or other items to print. 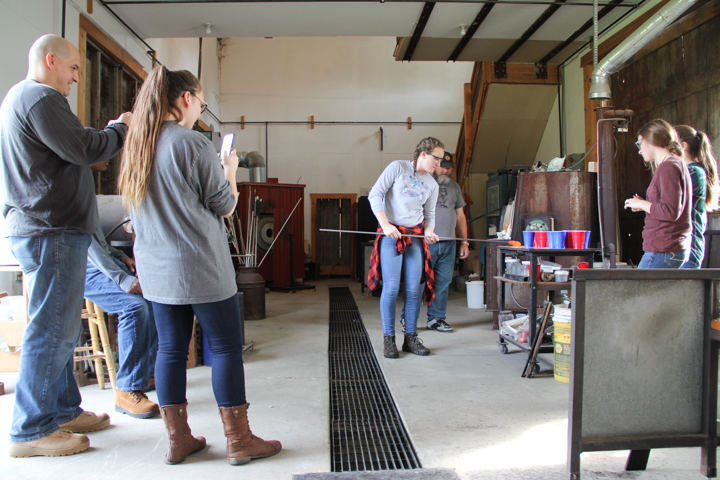 Using SAW’s glass studio and equipment students will learn basic glass blowing techniques. Each class students will build their skill set to create increasingly complex glass sculptures and vessels. Students will explore different techniques of working with clay. Weekly demonstration will help participants develop skills in wheel-throwing and hand-building. There will be discussions of form, texture and function. All levels are welcome. Clay pieces made in class will be fired in one of SAW’s wood-kilns, finished pieces will be food safe and ready for exhibition. This class is an introduction to blacksmithing. Students will begin with how to starting a coal fired forge and basic blacksmithing techniques. As students’ skills progress, they can choose to pursue projects of personal interest. Students should expect to learn the basic metallurgy and skills necessary to work independently on their own blacksmithing projects. In this workshop, students will learn how to use different types of welding and cutting equipment. Participants will start their training using a MIG welder and plasma cutter and move on to torch cutting. Students can practice by making sculpture, decorative or functional objects, or even repair items from home. Art 201 is made possible by the New York State Council on the Arts with the support of Governor Andrew M. Cuomo and the New York State Legislature. Additional support is provided by Stewart's Shops, Curtis Lumber and Private Donors. If you would like to support this programming please contact us.